Euddogwy is best known as the third Bishop of Llandaff and successor of St. Teilo. In reality, he was a ‘Bishop of Teilo’, the diocese based at Llandeilo Fawr which preceded Llandaff, and probably the fifth or sixth bishop in that line of succession. According to the traditional story, Euddogwy was the son of Budic ap Cybrdan, a prince of Cornouaille in Brittany, and Anawfedd ferch Ensig, the sister of St. Teilo and great grandaughter of King Ceredig Ceredigion. Budic had fled to the Dyfed court of King Aergol Lawhir when the rightful King of Brittany’s throne had been usurped, probably by King Rivod. Euddogwy was supposedly born in Brittany shortly after his triumphant return. Budic promised his new son would enter the Church and be sent to Britain to train under his uncle St. Teilo which he did. Unfortunately, Euddogwy flourished some forty of more years after Teilo’s death. He could not possibly have been the son of the Budic, the contemporary of Aergol. This Budic appears to have been King Budic II of Brittany, usually said to have been a son of either King Erich or his brother King Budic I. Perhaps Budic ap Cybrdan was a later man of the same family. Cybrdan would have been of the generation of King Judicael ap Hoel III of Brittany. Euddogwy certainly came to Wales in his youth and may well have been trained at Llandeilo Abbey. When he succeeded to the Episcopacy, it is said he travelled to Canterbury for his consecration. He may have been the founder of the church, probably a monastery, at Llandaff, rather than the traditional Teilo. One legend tells how he removed a number of relics of St. Teilo and his disciples from Llandeilo to Llandaff. The men of Llandeilo were not best pleased and ambushed his party in a rocky pass at Penallt. Through Euddogwy’s prayers, the attackers immediately became blind and unable to move. Once, when thirsty, Euddogwy asked some women washing butter for a drink. They laughed at him, claiming to have no vessel in which he could collect the water. The saint picked up some of the butter and moulded it into the shape of a bell. He took his drink and the butter turned to gold! Like many Welsh bishops, Euddogwy apparently made a pilgrimage to Rome. At home, he is said to have come into conflict with a certain Gildas (not the saint of that name who lived somewhat earlier) after he appropriated some wood cut for Euddogwy’s building operations. The Book of Llandaff records a number of grants of land to Euddogwy during his episcopate by various princes of South-East Wales. 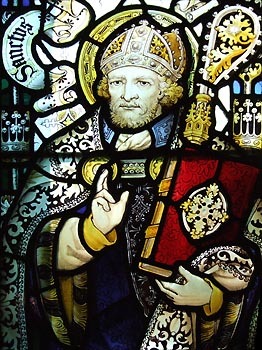 As bishop, he was a contemporary of King Cadwgon ap Cathen of Dyfed, King Awst of Brycheiniog, King Meurig ap Tewdrig of Glywysing & Gwent, and the latter’s grandson, Morgan and Ithel, who flourished in the middle of the 7th century. It was during Euddogwy’s time that the English seized the region between the Wye, the Dore, and the Worm (Herefordshire), an event generally supposed to have been made under King Penda of Mercia. According the Annales Cambriae, this occurred in AD 649. Euddogwy had a retreat at Llaneinion (Llandogo), near Dinteyrn (Tintern), where he often withdrew to live in solitude. There he died (traditionally after having already resigned his bishopric) on 2nd July, around AD 700. He was supposedly buried in the church at Llandaff, probably then an abbey. Oudoceus is the usual form of his name. However, Euddogwy is the correct modern form, though rarely used, except at Llandaff Cathedral which is dedicated to him.